Sunday, Feb. 17, 2019: Italy’s Migration Present. It used to be that Italians left their country for better opportunities. Now, people from other countries are coming to Italy for the same reason. Portland State Italian Professor Angela Zagarella gave us a lesson in recent Italian history, as well as current Italian politics and culture, and the influence of immigrants to Italy. Sunday, Oct. 21, 2018: An Open Secret. 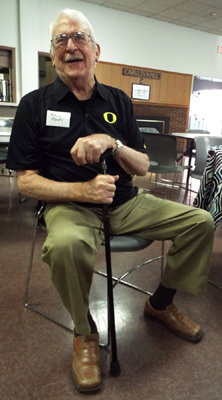 Clark College history instructor and former club president Joe Cavalli told us about Italy’s involvement with Nazi concentration camps during World War 2. Sunday, May 20, 2018: A year in Italy! Blogger and author Jacqueline Jannotta Rothenberg regaled us with stories of the year she and her family pulled up stakes in Portland and moved to Genoa for the ultimate Italian immersion experience. She gave us the good and the bad of their time in Italy, as well as her insights into what make Italians and Americans different … and alike. Sunday, March 18, 2018: The Ice Cream Entrepreneur. Sandro Paolini, owner and confection creator at Pinolo Gelateria at 3707 SE Division in Portland joined us. He regaled us with stories of growing up in Pisa, then coming to the U.S. to strike out on his own. Originallly, gelato had nothing to do with it, but eventually (after a return to the old country) he came to Portland determined to show the Rose City what real Tuscan gelato tastes like. Luck for us, Sandro brought some examples to share with us … and we ate them all! Saturday, Dec. 16, 2017: Holiday Happy Hour! We at great appetizers and desserts, toasted the season and sung up a storm. Sunday, Oct. 1, 2017: Dolce Vita Confidential! Author Shawn Levy joined us for our first-ever double-feature meeting: a film at 12:30pm, followed by a gust speaker at 3:30pm! We watched Fellini’s La Dolce Vita, a film which (even almost 60 years later) confuses and captivates. Then Shawn joined us to help make sense of what we saw. Sunday, July 9, 2017: Annual BBQ. 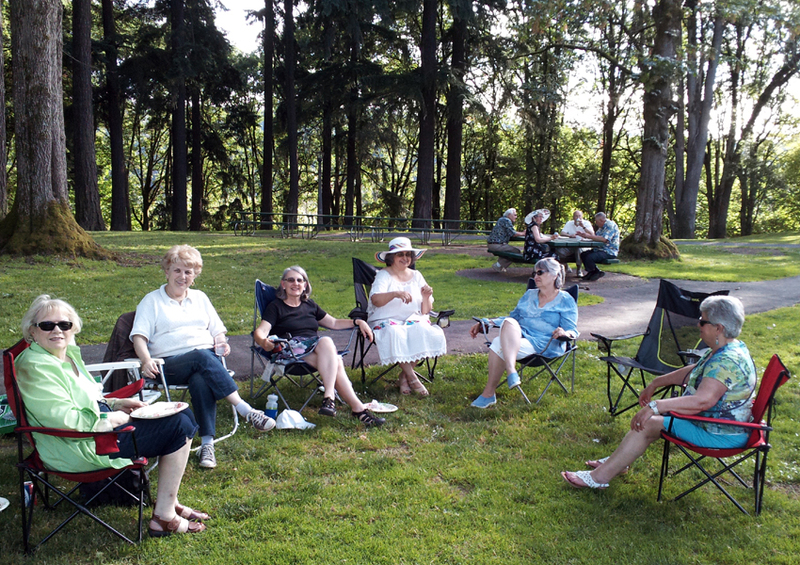 Whether seated indoors or outside, about 20 OregonTuscans enjoyed themselves at a cookout at Audrey Perino & Ken Kane’s home. 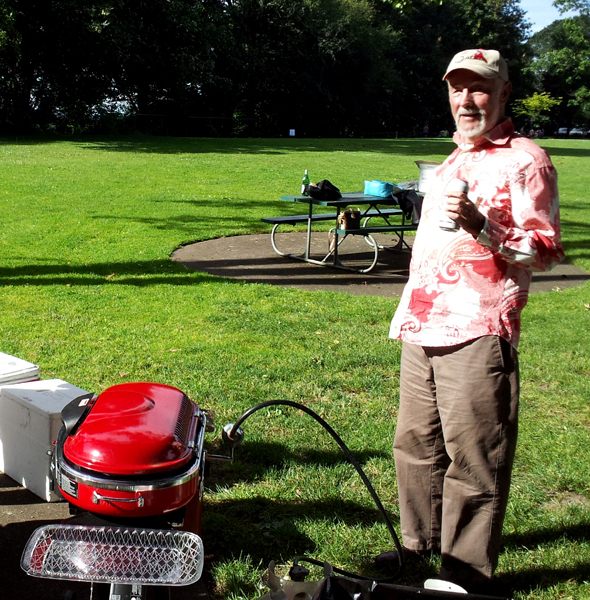 Burgers, Italian sausages, wine and an array of potluck salads, side dishes and desserts kept everyone full and happy! Sunday, April 30, 2017: The Painter, the Pope and the Apartment. Clark College art history professor Lisa Staley took us on a tour of the Stanza della Segnatura, the High Renaissance masterwork of Raphael. He painted it in the Vatican apartment of Pope Julius II in the early 1500s. Sunday, Feb. 19, 2017: Andrea Bocelli — Cinema. We watched a concert video of the Tuscan tenor Andrea Bocelli. 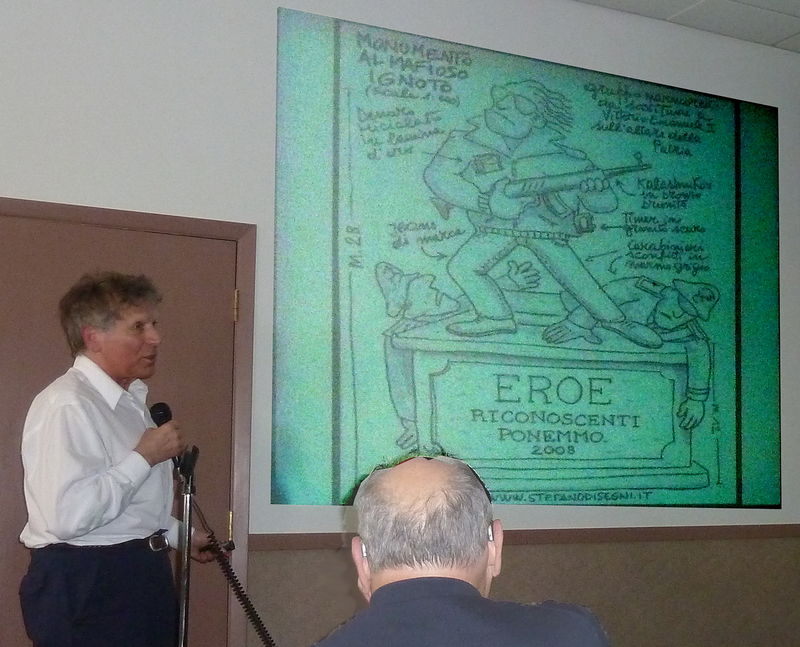 Then Gino Pieretti shared some insights into what makes the singer so popular and interesting. For more details of the meeting, click here. Sunday, Jan. 22, 2017: Festa della Befana. Well, it took the queen of sweepers an extra two weeks to make it to Portland — she should have traded in her broom for a snow shovel! — but La Befana finally made it to Carvlin Hall. Our annual children’s tradition was a hit. See a photo summary here. Sunday, Dec. 18, 2016: Holiday potluck. 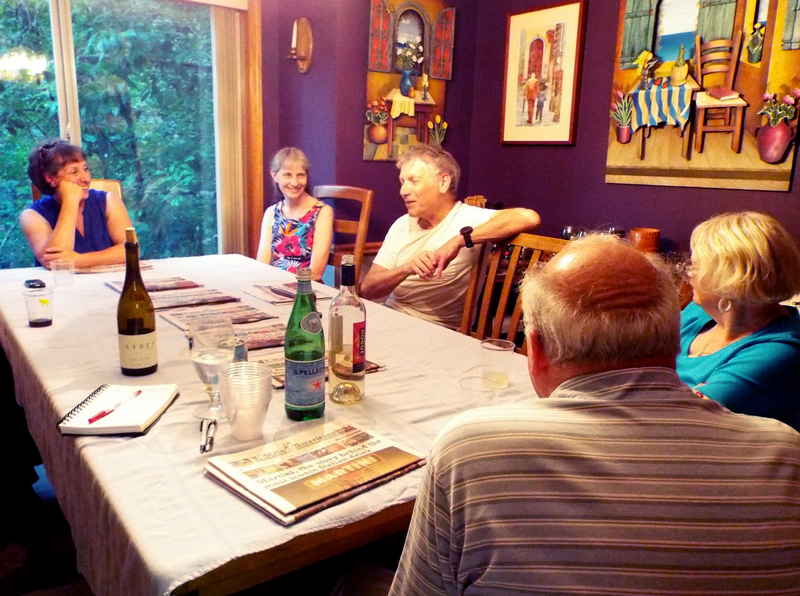 We ate, drank and made merry … and even learned a little about current Italian politics from Honorary Italian Consul Andrea Bartoloni. Sunday, October 9, 2016: Our club at a crossroads. 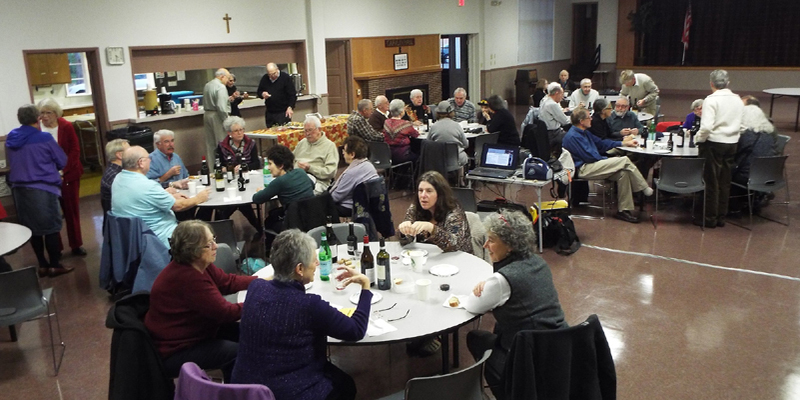 Having gone the summer without a club president and without any planning for the coming program year, sixteen OregonTuscans gathered to discuss what to do. A consensus was reached to continue as an independent club, with a reduced meeting schedule, and a program committee in lieu of a president … for the short-term. Read how the discussion went here. Saturday, June 25, 2016: Year-end picnic. A group of us gathered at Audrey Perino & Ken Kane’s home to barbecue, eat, drink and make merry. Sunday, May 15, 2016: Venice through Marlene’s eyes. Member Marlene Hill shared excerpts from the latest book in her Venetian Waters series, A Matter of Trust. We got some insights into the writer’s art, not to mention some breathless passages! 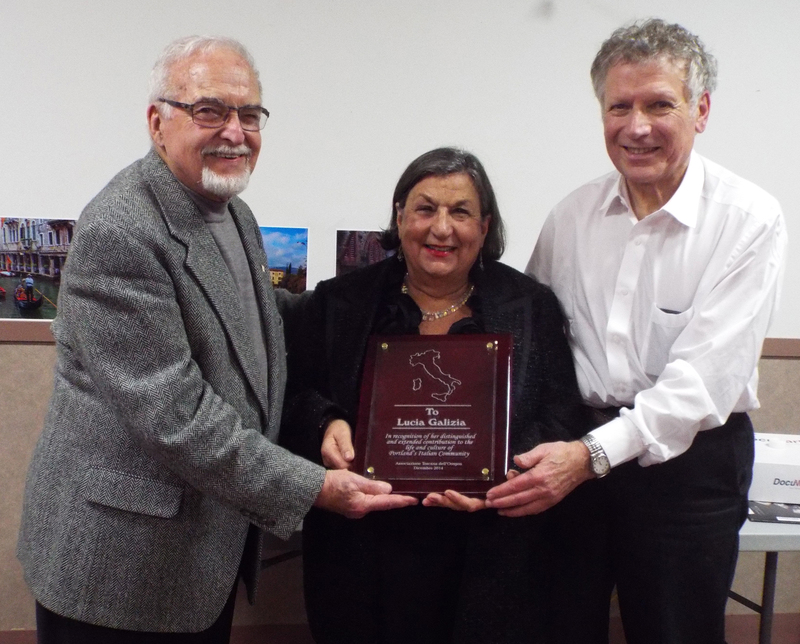 Sunday, April 17, 2016: The Tuscan Association turns 20! Oh, what fun we had, with plaques and cakes, and wine and videos from as far away as Tuscany! All to mark 20 years of our Tuscan Association. For the video congratulations, click here. Sunday, March 20, 2016: My Italy Slide Show & Tell. 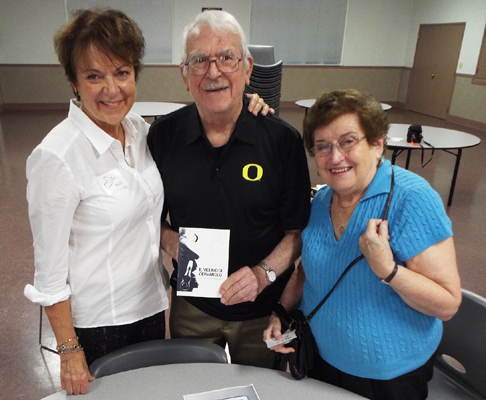 Nearly 20 OregonTuscans shared their photos and memories of Italy in a fun, seat-of-your-pants round robin of sights and stories. Sunday, February 21, 2016: Design Is One. We watched a documentary about the Italian design team of Massimo and Lella Vignelli. Married and business partners for over half a century, the Vignellis revolutionized corporate design by keeping things simple. Their legacy stretches from the New York City Subway System to the brochure you’re handed when you visit Fort Vancouver. Sunday, January 10, 2016: Festa della Befana. 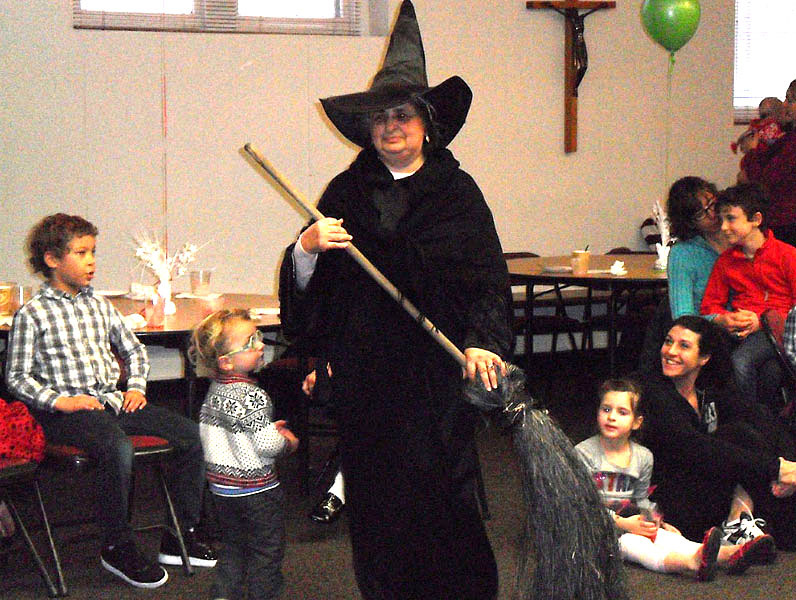 It was a clean sweep for La Befana at our annual Epiphany party for children. About 100 people took part … read more here. Sunday, December 20, 2015: Mangia! Mangia! 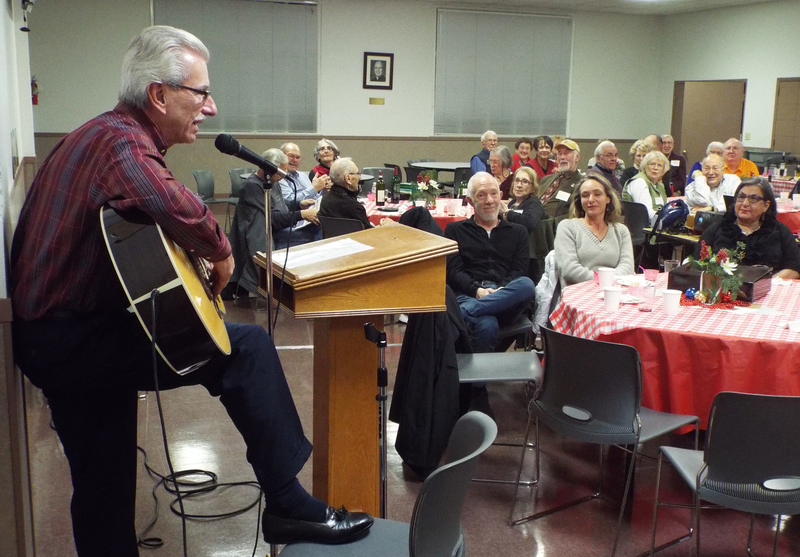 Our Christmas potluck dinner filled our bellies with great food and our hearts with wonderful song! Check it out. 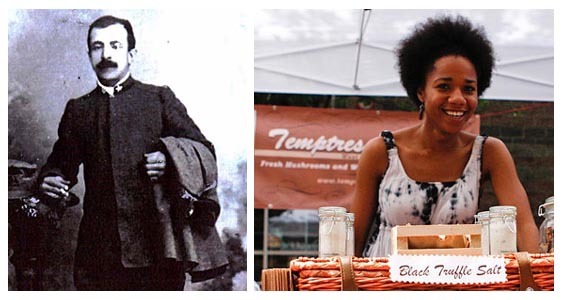 Sunday, November 15, 2015: Sacco & Vanzetti. Jimmy Mogila recounted the notorious case of two Italian anarchists wrongly accused of a murder near Boston in 1920. Their eventual execution, following one of the most headline-grabbing trials of the 20th Century, is still the subject of debate. Sunday, October 18, 2015: The Italy of the 1970s. Portland State Professor Silvia Boero discussed the politically turbulent decade of the ’70s in Italy. She used Italian cinema to illustrate her talk, specifically, scenes from the film La Mazurka del Barone, della Santa e del Fico Fiorone. Sunday, June 27, 2015: 90-degree-plus temperatures forced our club BBQ indoors. But we still had a lot of fun. 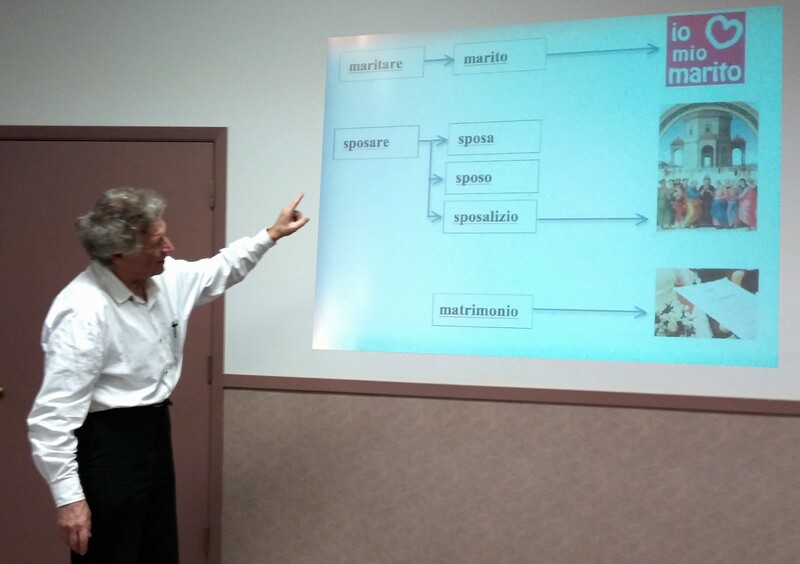 Sunday, May 17, 2015: Jimmie Moglia spoke on the curious history of the Italian language. Sunday, April 19, 2015: Guest speaker Matteo Luccio spoke about the field of Geospatial Technology and how it influences our everyday lives. 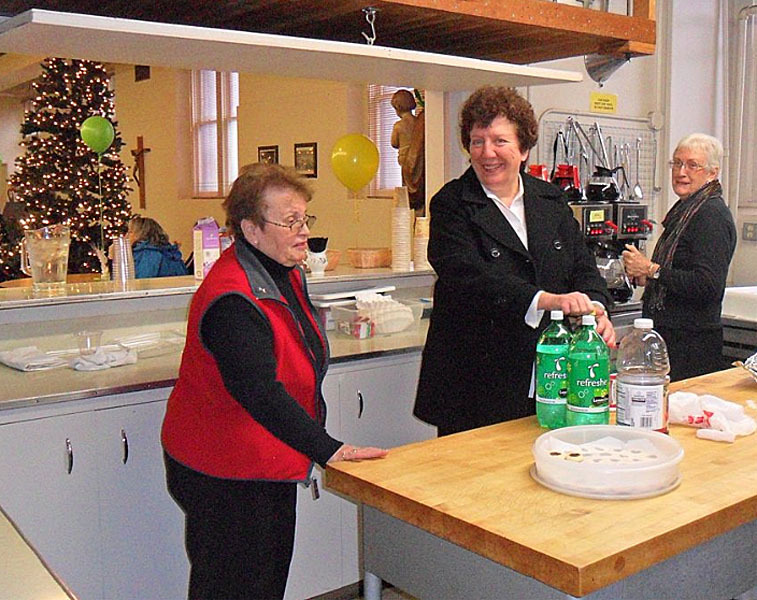 Sunday, March 15, 2015: The Italian Americans. We watched the final episode of the PBS documentarty The Italian Americans, covering the years since the end of World War II. Then we had a free-flowing discussion of our experiences growing up as imiigrants or children of immigrants. Sunday, Feb. 15, 2015: Taste Unique. Our guest speaker was Stefania Toscano, who owns Taste Unique, a take-home Italian food store just up the street from Carvlin Hall at 2134 SE Division. 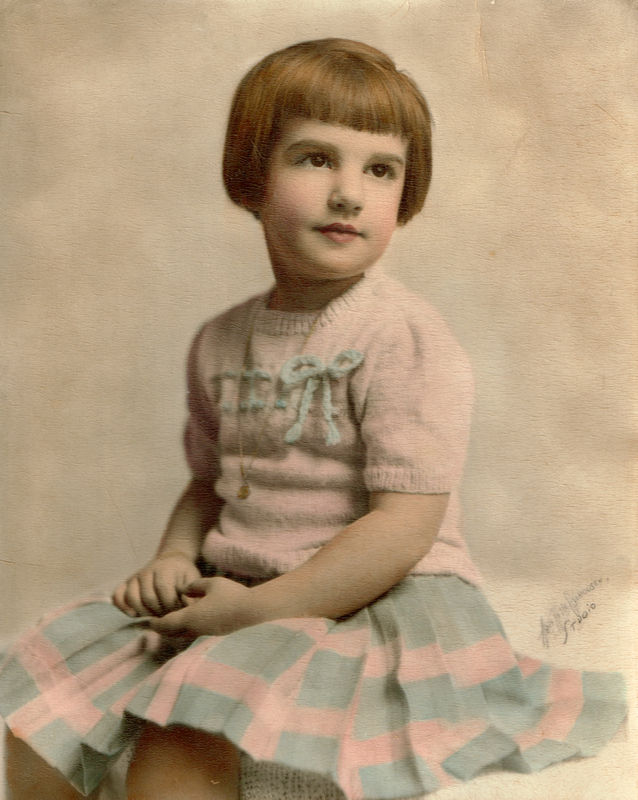 She shared with us one of her prized possessions: an 1809 Italian cookbook owned by her aunt, the person who more than any other inspired Stefania’s passion for food. Click on the book to the left for a further summary of our meeting. Sunday, Jan. 11, 2015: Festa Della Befana. 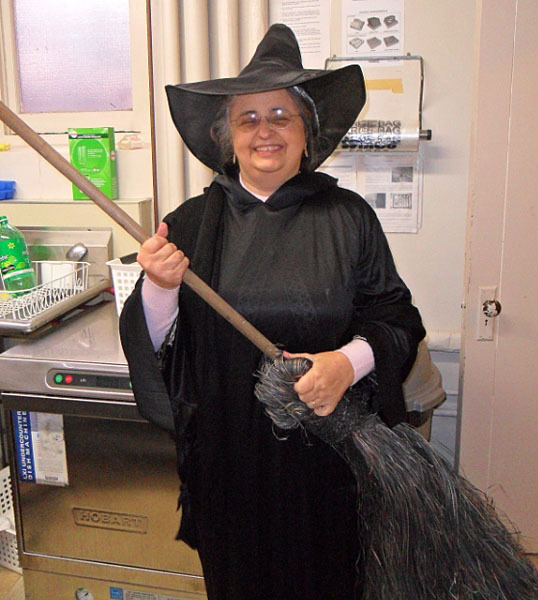 Our favorite witch … or is it our favorite cleaning lady? 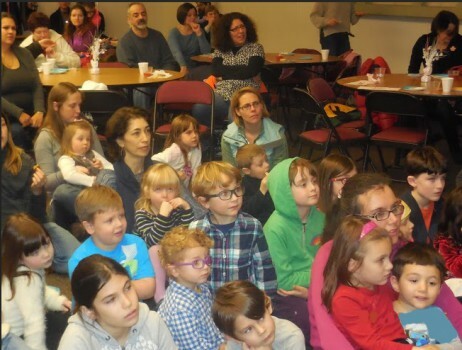 … delighted more than 50 children at St. Michael’s church in our annual collaboration with Amici d’Italia to renew the centuries-old Italian tradition of the Twelfth Day of Christmas. For a summary of the day, click here. 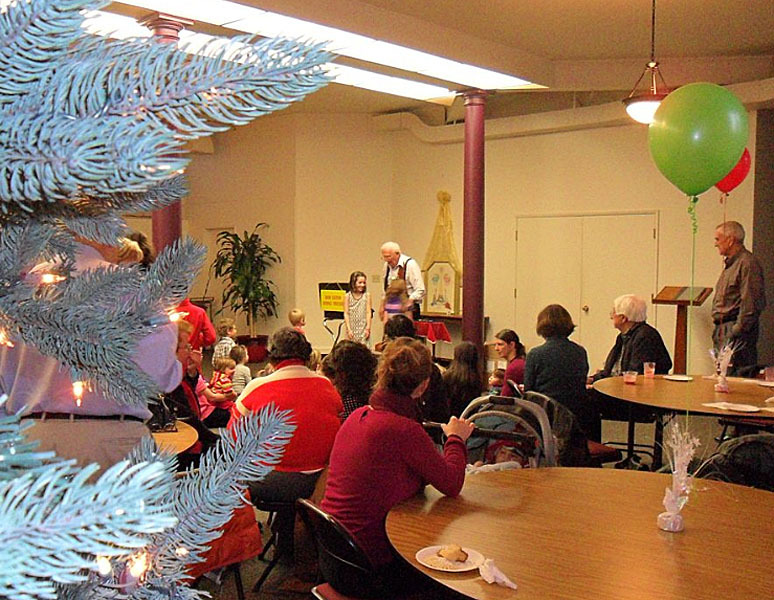 Sunday, Dec. 21, 2014: Holiday potluck. We started the meeting with a presentation to Lucia Galizia who has been a strong supporter of the local Italian community for decades. After a great potluck dinner with all kinds of delectable dishes, we settled in for musical entertainment by club members and guests, including Lucia’s husband. For more on the meeting, click here. Sunday, Nov. 16, 2014: Classic cinema. 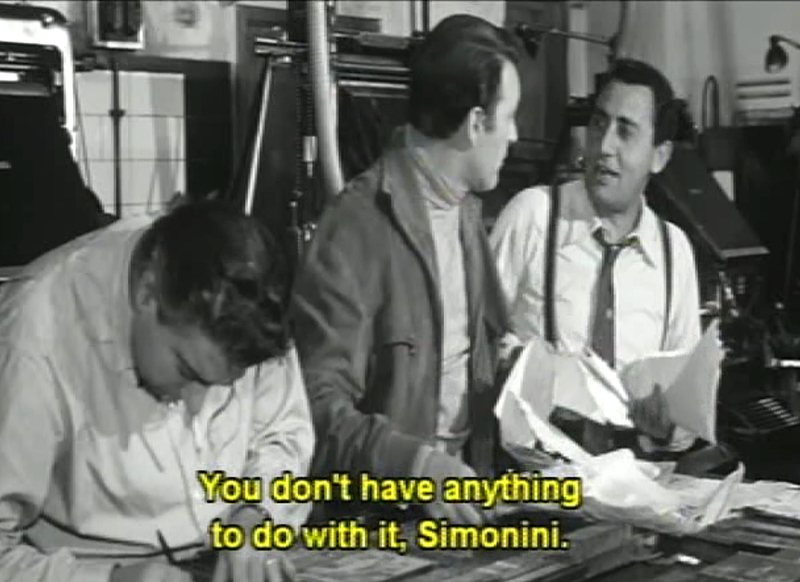 We finished watching the 1961 Italian film Una Vita Difficile. Sunday, Oct. 19, 2014: FDI and Una Vita Difficile. We started the program year with the screening of the first part of the 1961 film A Difficult Life, about post-WWII Italy and the struggles of a nation and its citizens. Jimmie Moglia then began a series of Fast, Dynamic Italian (FDI) lessons, aimed at gaining more comfort with the Italian language. 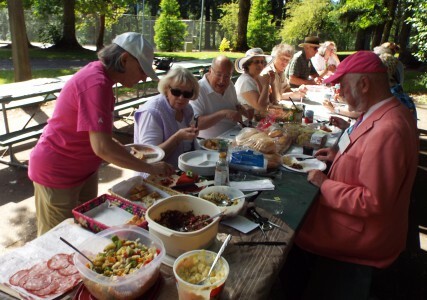 Sunday, June 22, 2014: Sellwood Park picnic. Italian sausages, burgers and great side dishes were the order of the day as we closed out the program year with a sunny summer BBQ. Click here for details. 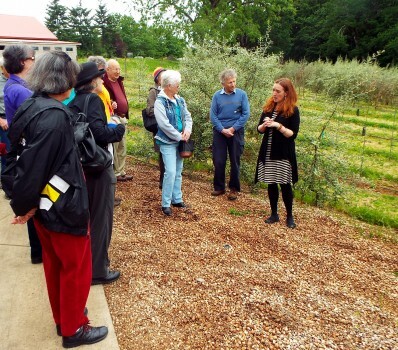 Sunday, May 18, 2014: The Oregon Olive Mill field trip! Twenty of us had a great time — even the rain held off! — at Red Ridge Farms in Dayton, Ore. We toured the Oregon Olive Mill, walked amongst their lavender, flowers, grapes and 13,000 olive trees, and enjoyed a professional-style tasting of their products. Click here for details. Sunday, March 16, 2014: Art of the Sistine Chapel gave us a glimpse into the mind of a master, in this case Michelangelo. We thank Prof. Lisa Staley for an insightful program. Click on the image to below to see a summary of the meeting. Sunday, Feb 23, 2014: Our Sweethearts’ Dinner provided both a plateful and an earful. Click on the photos below to see more. Sunday, Jan. 5, 2014: La Befana We joined forces with Amici d’Italia to continue an Italian tradition and thrill dozens of kids. Click on the photos for a summary of the event. Sunday, Dec. 15, 2013: An Apartment in Venice, a Tuscan Trio and Jimmie the Trubador Our Christmas potluck included plenty of entertainment. Click on the photos for a summary of the event. 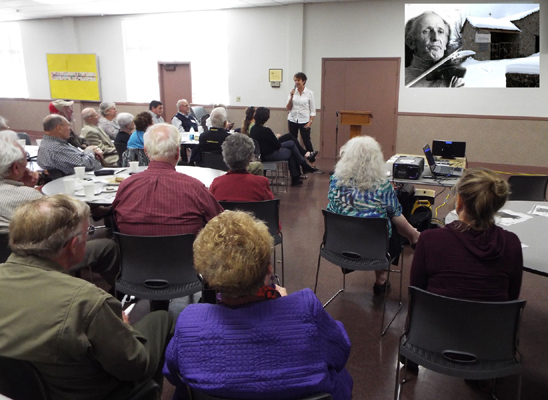 Sunday, Nov. 17, 2013: Audrey’s Excellent Adventure Club president Audrey Perino shared slides of her recent music and hiking trip to Italy. 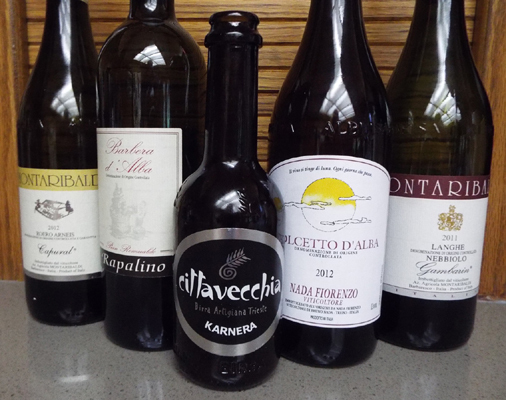 We tasted some of the wines of Piedmont. 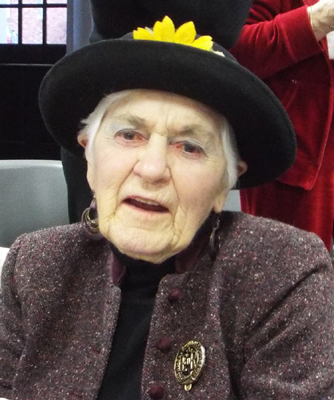 And we wished a fond farewell to Esther Tuon Riley, our dear friend in her wonderful hats, who is moving to Vancouver, BC. We also had an advisory committee meeting before the general meeting to plan out the next few months. Sunday, Oct. 6, 2013: Il Violino di Cervarolo. 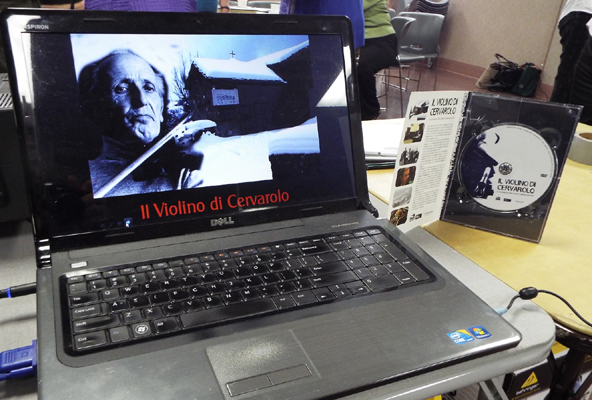 We explored a dark day in Italian history through a documentary film. Retreating German soldiers massacred residents of several Apennine villages late in World War II. One of those towns was Cervarolo, where our own Mario Monti grew up. Mario and his daughter, Jan, told us about the pre-war village, then we watched the film, which chronicled the the atrocities and the trial which finally helped bring justice nearly 70 years later. We were also visited at the meeting by Angelo and Christine Scatena from Perth, Australia. Angelo oversees Tuscan Associations in his home country and in South Africa. He came to the U.S. to visit family and stopped in on his friend Carlo Mannocci. Saturday, June 22, 2013: Sellwood Park Picnic We enjoyed an afternoon under the sun and amongst the trees of Southeast Portland’s Sellwood Park. Then it was time for our club auction and potluck. 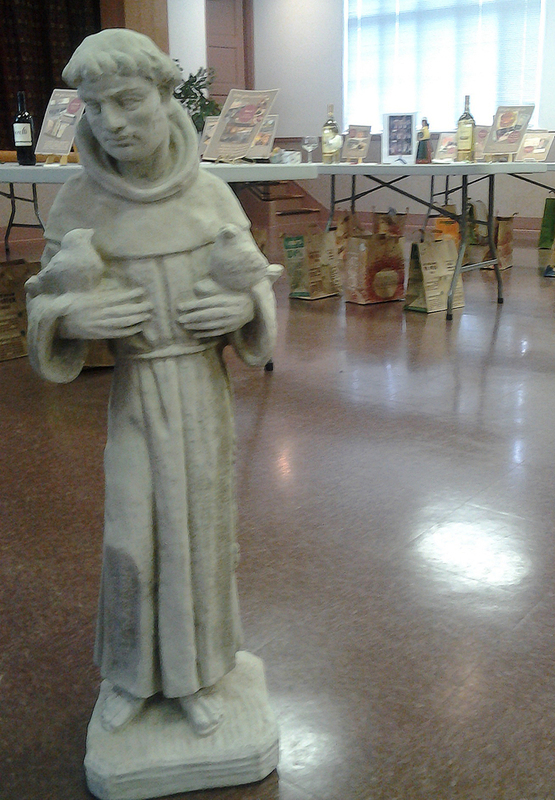 St. Francis approved and so did Carlo and Audrey. In all, we raised $914. Thanks to all club members who donated items, worked the hustings to solicit donations, and to those who bought items … and yes, we know that in many cases, you were one and the same! And we hope you will support the generous businesses who contributed to our auction … Bacchi’s Italian Deli, New York New York Pizza and Deli, Cibo Restaurant, a Cena Ristorante, Gino’s Restaurant, Small Vineyards Distributing/August Wine Company, Ital’Art/Garden Home Decor, La Perla Pizzaria, Beppe & Gianni’s Restaurant, Caro Amico Restaurant, CorksCru Wine Shop, Lair Hill Bistro, Tucci Restaurant, Porcelli’s Ristorante, and Canoe Gift Shop. 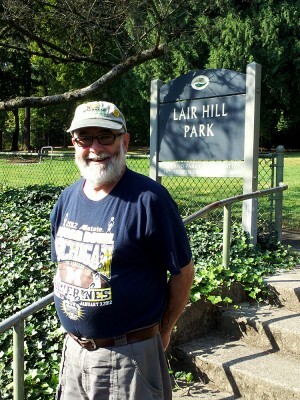 Sunday, April 21, 2013: Once Upon a Time in Lair HillThis collaboration between the OregonTuscans and neighborhood historian Arnold Panitch (below) told 125 years of South Portland history. If you missed the slideshow, future showings will take place for other groups. We’ll let you know when. March 17, 2013: Art & Politics BUSINESS; Clark College art history professor Lisa Staley dissected Botticelli’s painting Primavera. Then, Carlo Mannocci and Jimmie Moglia brought us up to date on the Italian parliamentary elections, in which Five Star’s Beppe Grillo proved to be the spoiler. Feb. 17, 2013: ‘Shrooms! 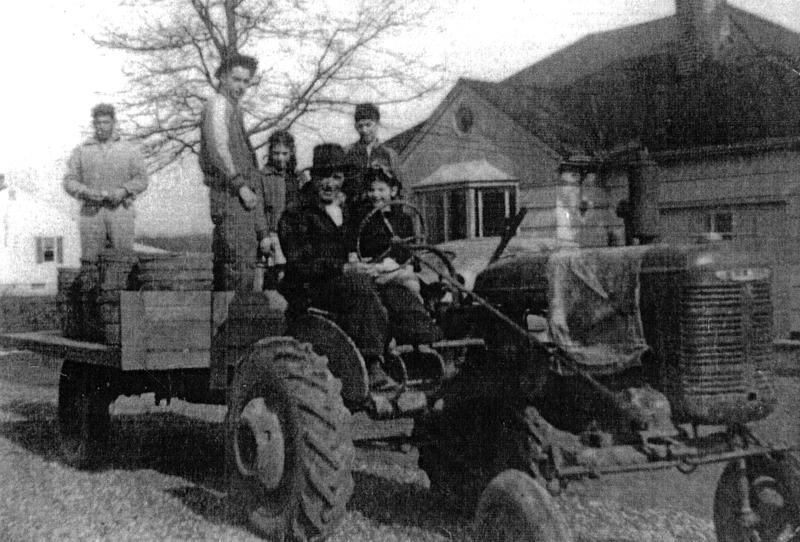 FAMILY MATTERS: Bill Galbreath went back almost 140 years to talk about his family. BUSINESS: Our guest speaker, Elan Hagens of Temptress Truffles, shared her expertise and strategies about mushroom hunting. 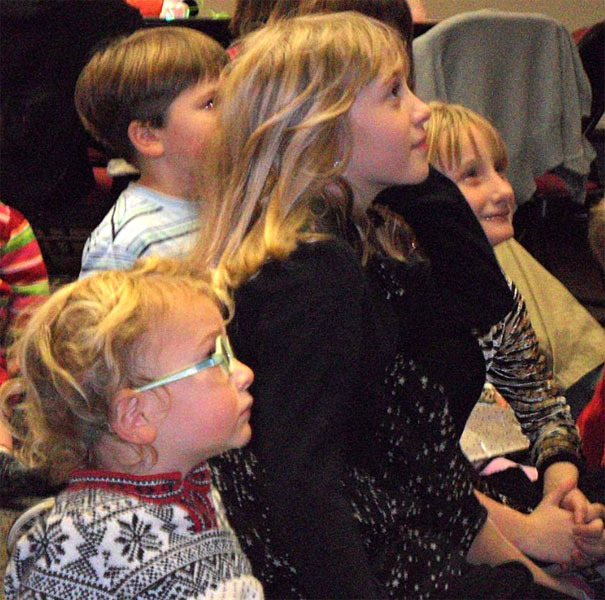 On the Twelfth Day of Christmas, our clubs gave to youngsters magic, food, gifts and a good time. 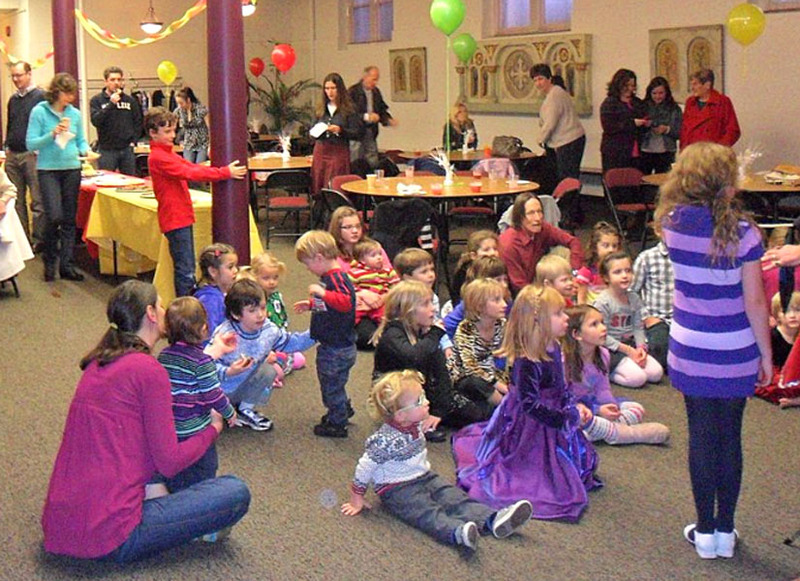 Of course, La Befana is all about the kids, and we had 37 of them. 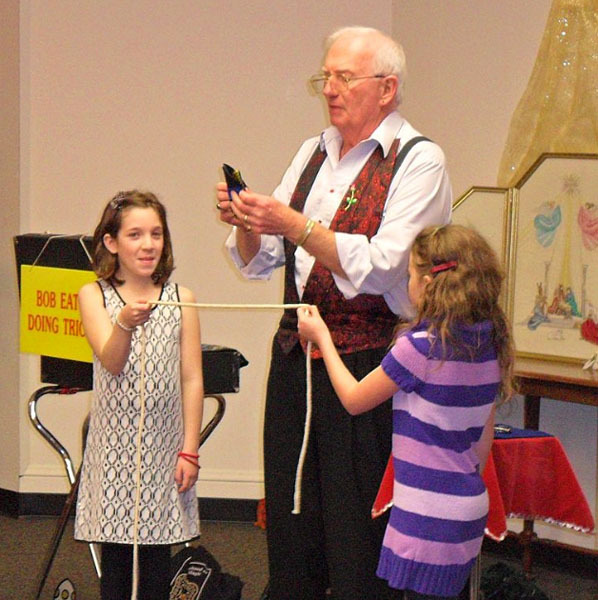 Magician Bob Eaton with two helpers. And the star of the show was our own Louise Ramunno-Johnson as La Befana! All hail the kitchen crew, including Dorrie Palandrani! 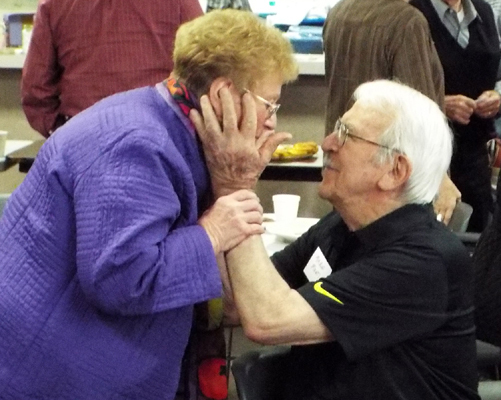 While Dorrie was in the back, husband Frank was out front making sure everything was going smoothly. And, of course, it was! Thanks to both clubs, our volunteers, the kids and their parents, and especially to Frank and Kerry-Lynne for coordinating the event. 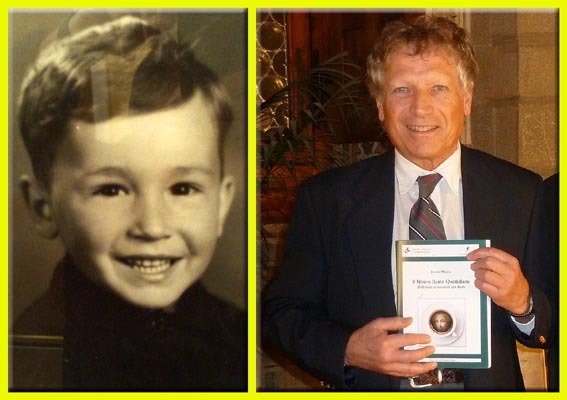 FAMILY MATTERS: Gino Pieretti talked about growing up in Southeast Portland, in the area right around St. Philip Neri Church. 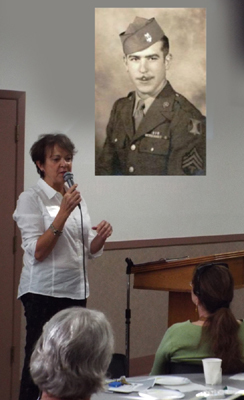 BUSINESS: We heard from Jimmie Moglia about his new Italian language book, Our Daily Dante. Both Jimmie and Carlo Mannocci reviewed the book’s unveiling ceremony, which took place in Florence in November. 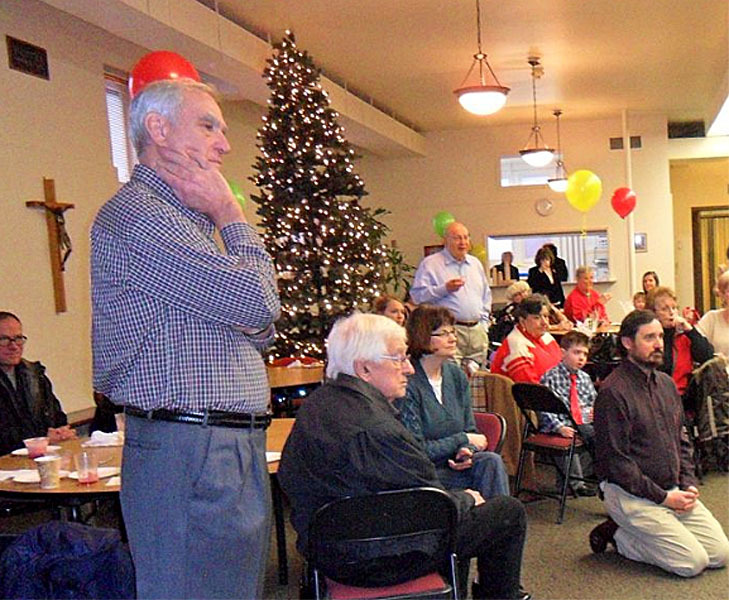 We wrapped up the meeting with a potluck and by singing some Christmas carols. 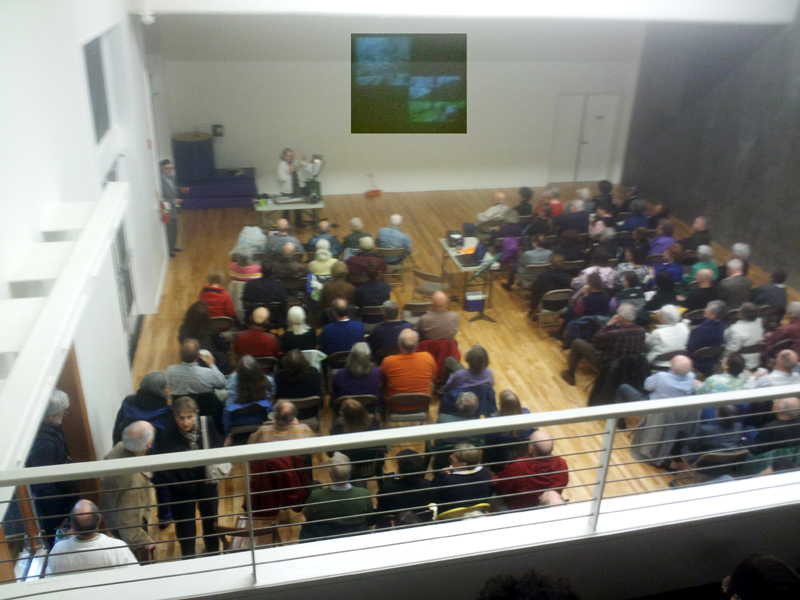 Nov. 18, 2012 meeting: Top Chef … OregonTuscans style! 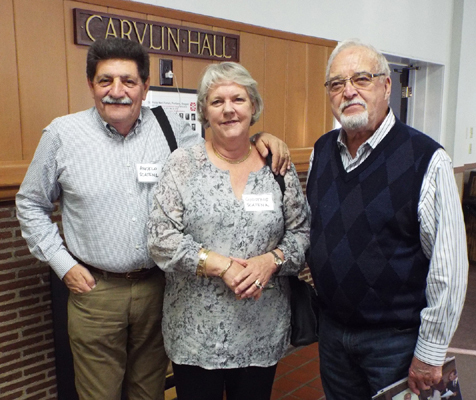 FAMILY MATTERS: Club president Audrey Perino (below,left) talked about her Tuscan heritage and how she became a charter member of the Tuscan Association. BUSINESS: This meeting was all about the business of cooking! 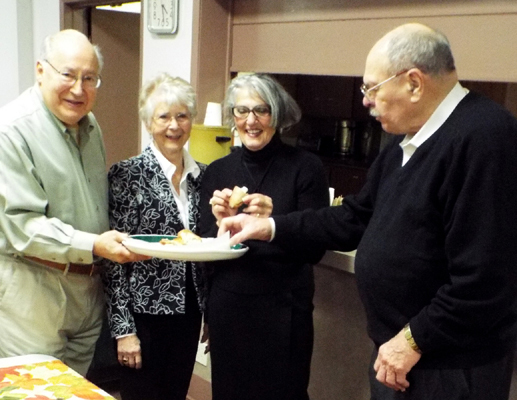 A host of presenters shared recipes for Thanksgiving and the holidays, including Jack Hoffstetler (above, right) who sizzled up some homemade Italian sausage in Carvlin’s kitchen as the dishes and recipes were being shared out in the hall. In all, nearly a dozen recipes — from stuffed mushrooms to fennel in bechamel sauce to chocolate and chestnut cuggenette were discussed, and nearly all were sampled. Suffice it to say no one went home hungry! If you missed the meeting, you can still get the packet of recipes here. Thanks to all of our Top Chefs for a fun and informative afternoon! Oct. 28, 2012 meeting: Our club at a crossroads The Tuscan Association of Oregon is at a crossroads, but in a good way. Our new president, Audrey Perino, who with Carlo Mannocci, was just back from a convocation of leaders of Tuscan Assocations from across North America. She reported on the meeting. Carlo talked about changes to the Tuscan-sponsored young peoples’ study program in Siena. He also congratulated Jimmie Moglia on the publication of his new book about Dante. 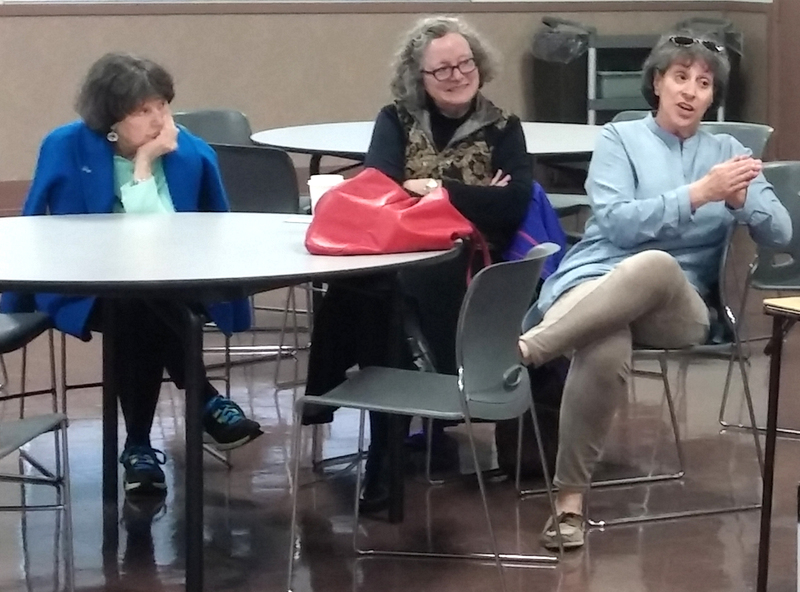 Audrey looked at the meeting dates for through the spring and proposed some programs for those gatherings. Audrey announced that dues will be rolled back to pre-2012 levels: $25 for singles and $35 for couples. Dues are due by February but are being accepted now. She said those who want a paper, mailed copy of the monthly newsletter will have to be dues-paying members come 2013. PROGRAM: Marlene Taevs discussed and read from her new novel, Last Fling in Venice. We’re happy to report she sold out of all the copies she brought to the meeting! 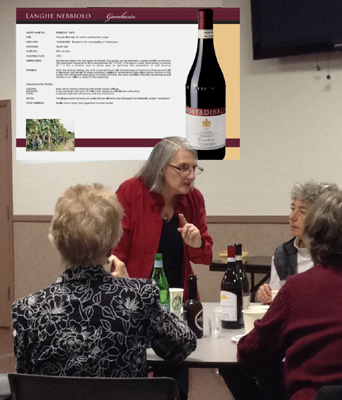 A video was shown which depicted a project of the Pittsburgh Tuscan Club. It brought a Puccini exhibit from Lucca to Pittsburgh and are also helping re-establish a vocal school in Lucca for aspiring opera and Broadway singers. If you missed it, you can see the video here. Oct. 20, 2012: meeting of Associazione Toscani Dell’America Del Nord Representatives of Tuscan clubs in Montreal, Toronto, Vancouver BC, Chicago, Pittsburgh, San Francisco, Detroit. Washington DC and Oregon gathered in Montreal. 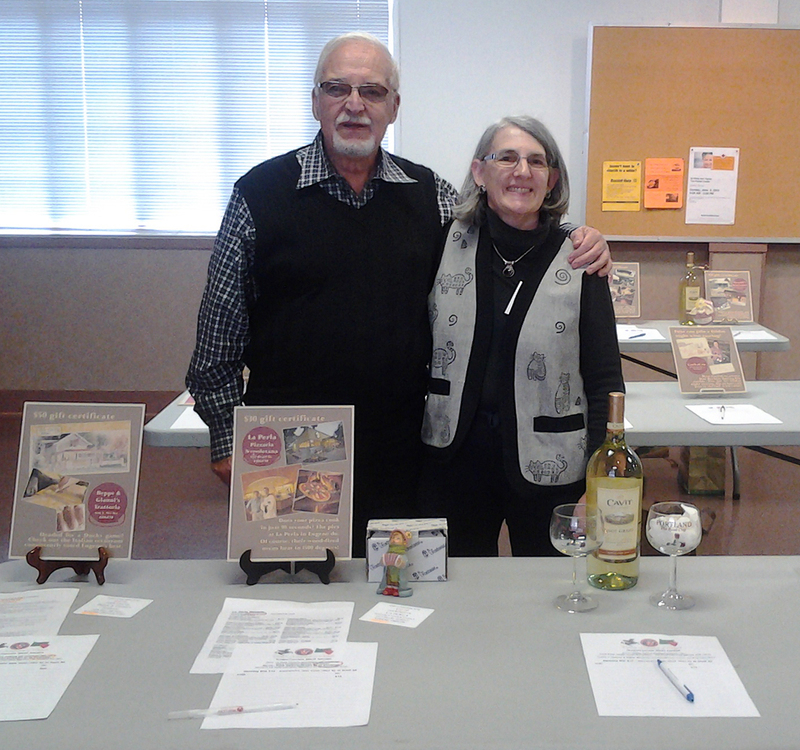 OregonTuscans were represented by Audrey Perino and Carlo Mannocci. The meeting was convened by Renzo Orsi (above, seated center), who oversees all North American Tuscan clubs. Also participating was Ilaria Del Bianco (above, seated left) who came over from Lucca representing the Regione Toscana and Associazione Lucchesi Nel Mondo. Matters relating to the Tuscan Region’s financial support of the world’s 110 Tuscan clubs were discussed. So was an expected reorganization of the administration of the Tuscan Region coming in 2015. Changes to the foreign student summer program which is sponsored by the Tuscan Region were also discussed. Chief among them are the fact that the Viareggio campus has been discontinued. The month-long program now takes place in Siena for three weeks and one week in Florence. Also, applicants must now have at least an elementary proficiency in the Italian language. This threshold will be determined by an online test. 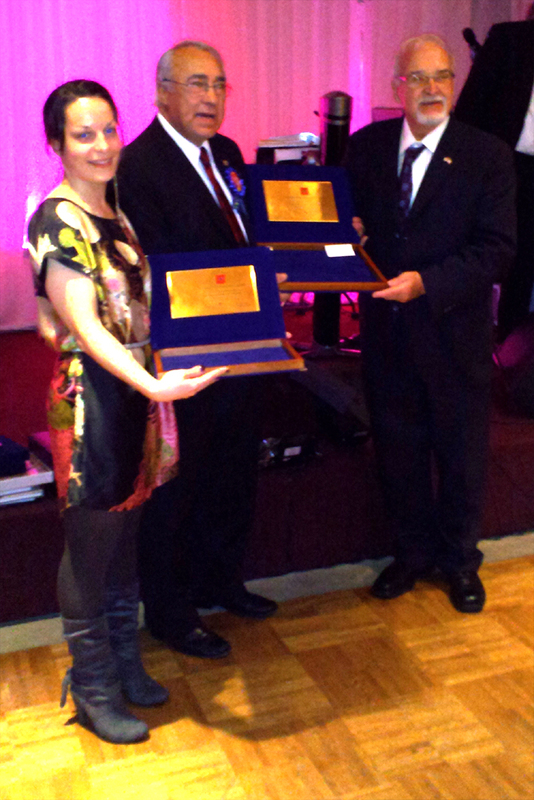 After the meeting, the delegation was the guest of the Club Sociale Toscano of Montreal at their gala which marked their 40th anniversary. Carlo presented an award to the club’s president and to the head of the club’s youth association (below).